This article focuses on the issues which may arise for central banks in the pursuit of monetary stability in the context of asset price volatility, and the impact thereon of growth of institutional investors such as pension funds, life insurers and mutual funds. The evolving pattern of volatility is considered to have entailed a major shift in the stability of central banks’ environment and poses difficulties for monetary policy. 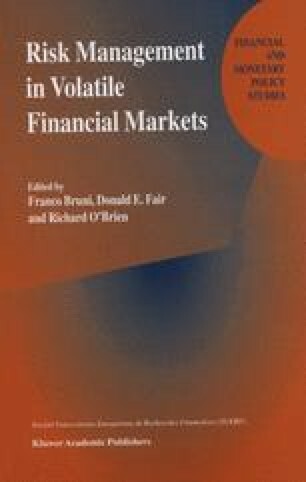 The article first seeks to outline the reasons why institutions may destabilise financial markets, drawing on the economic literature and the outcome of recent discussions of the author with major institutional players, and supplemented by indications of their growing size and activity. Then it outlines four periods of market volatility, where institutions were heavily involved, and that raised concerns for monetary stability, namely the stock market crash of 1987, the ERM crises of 1992–3, the bond markets in 1993–4 and the Mexican crisis of 1994–95. The paper concludes that the following features recur intermittently in international financial markets; irresistible and rapid price shifts, in both directions; heavy involvement of institutional investors in both buying and selling waves; bank lending playing a rather subordinate role; international investment; signs of overreaction to the fundamentals and excessive optimism prior to the crisis; at times, inappropriate monetary policies; a shock to confidence which precipitated the crisis, albeit not necessarily sufficient in itself to explain the scale of the reaction; and rapid and wholesale shifts between markets, often facilitated by financial innovations. There is a range of policy implications. In particular, monetary policymakers generally will have to take increasing account of the actions, views and expectations of institutional investors concerning their monetary policy and economic developments. There is also a rich agenda for further research in this area. The author thanks E. Gnan, J. Priesemann, J. Frijns and G. Rich for helpful comments. Views expressed are those of the author and not those of the EMI, Bank of England or Markets Group.